So our cork floor is in. The electrical got redone. We painted the walls. 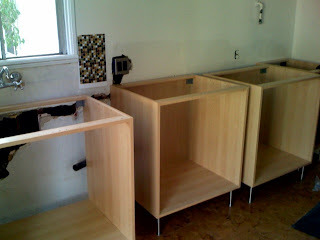 We assembled the frames of the cabinets with some help from our friends (one of them worked in high heels, fierce). A few more days and we're going to have a functional kitchen. I think. Most of the work has gone pretty smoothly though, I had a total freakout at the customer service department of IKEA. I'm not even going to say what happened. It was ugly, but it's all good now. Time to take the rest of the day off and get ready for tonight's festivities. Going to dinner at Oaxaca Mio with a bunch of friends and planning on having one last crazy, cooked meal for 2007. I'm going out with a bang because for the next month I'll be on a strict raw vegan plan. I've only been 50-75% raw since mid October when I went on vacation and have started to put on the pounds. I definitely have more energy when I'm totally raw so I want to get back to where I was over the summer. I felt better, looked better and had more clarity and creativity. I need all those things in abundance in my life right now. I've got a lot to do this next year!